To rebrand or not to rebrand, that is not the question. Branding should be a keystone of your strategy. It is how your business can command real ownership of a powerful, pertinent and unparalleled market status that delivers measurable commercial impact. When it comes to a company or product, branding isn’t just one thing, it is everything. Branding doesn’t just start at a name change. It can be a blunt instrument unless in the hands of master craftsmen. Here at Rocket our love for great brands and awesome branding manifests itself in years of hard graft at the branding grind stone, wielding some truly worldly-wise know-how and a desire to buff these rough stones into shining gems. We’ll help your business drive the values into the culture of your company and the development of a cohesive identity across all your current and any untapped channels to reach, resonate and engage with big audiences. Brands are the fuel to everything a business runs on, intrinsically linking to growth. At Rocket, we unearth the essence of your business, extract unique qualities and fashion them into an authentic brand strategy. That strategy will then translate into a verbal and visual brand. This clarifies messaging, increases differentiation, builds customer loyalty and drives revenue. 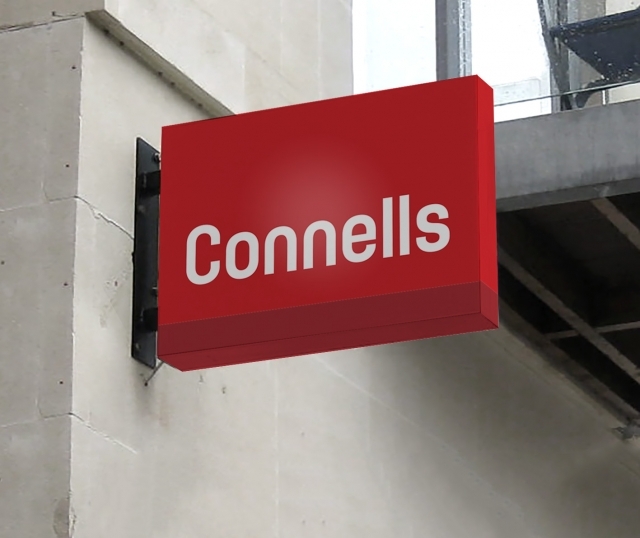 Take Connells, one of our longest standing clients, who tasked us with ‘refreshing’ their Corporate Identity. 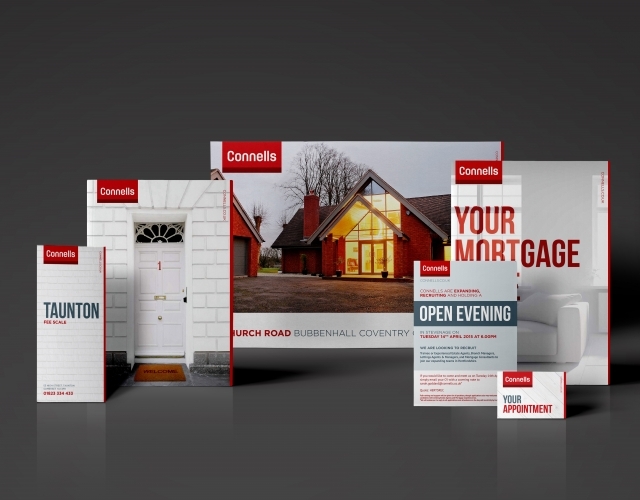 As one of the UK’s most recognised estate agencies, Connells required a brand refresh. A modern twist was needed to the 15-year-old logo, one that would be eye-catching. It needed to stand-out both online and on the street whilst maintaining the integrity of its heritage. Rocket’s input began by examining the core elements and developing a comprehensive plan to minimise financial requirements for this 175 branch roll-out. We believe our contemporary touch on the logo, the development of an impactful colour palette and the delivery of a strong set of brand guidelines has significantly strengthened Connells’ presence in the residential estate agency market. The bold combination of red, white and grey tones, along with a revitalised font has enabled the branding to filter into the businesses’ collateral. Including the ‘For Sale’/’To Let’ boards, branch posters, customer mailers, digital media and more. Whilst we work with some brilliant blue chips, we have a real passion for growing local brands within the community. 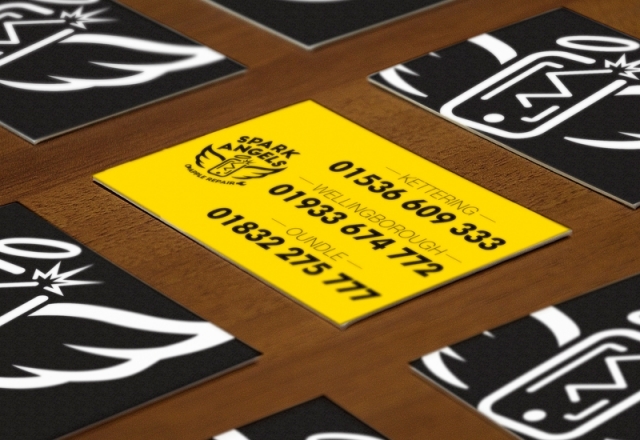 Our work with local company Spark Angels, iPhone Repair Specialists, saw the merging of three separate locations and brands into one super-brand within Northamptonshire. A change of name and a logo to match saw the spark of an innovative winged icon. It has since become emblematic to the brand through our social advertising, promotional displays and viral videos. If your business finds itself in need of a brand revival, Rocket will be happy to ‘repair’ or ‘fix’ where possible, ensuring you’re SOLD on our plethora of ideas. As a full-service agency, we can take your business from a brand follower, to brand leader. Call us today to find more on how we can activate your brand.